Yesterday, an L.A. bookstore started a campaign to make literary icon Joan Didion the female face of the ten dollar bill (#JoanOnTheTen). Didion is arguably more popular than ever. Last October, a Kickstarter campaign raised over $80,000 in just a few days (and over $200,000 in all) to fund a feature-length documentary on the author. And currently, Tracy Daugherty’s 750+ page biography on Didion (St. Martin’s Press) is scheduled for publication in about two weeks. The latest movement to update our currency to depict a woman isn’t so new. In 2012, the grassroots organization Women on 2os first petitioned that an iconic American woman replace Andrew Jackson’s face on the $20 bill. The group held an open, online “primary” election where the public voted for three of 15 candidates, including influential women such as Sojourner Truth, Susan B. Anthony, Clara Barton and Betty Friedan. The second round of elections narrowed down these candidates to four finalists: Eleanor Roosevelt, Harriet Tubman, Rosa Parks, and Native American activist Wilma Mankiller. Skipping ahead to 2015… In June, U. S. Treasury Secretary Jack Lew announced plans for a redesign of the $10 bill to be issued by 2020. Who would replace Alexander Hamilton is still undecided. 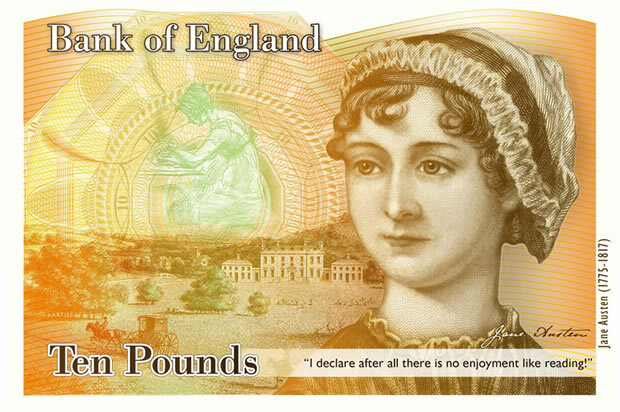 Interestingly, just a few weeks after Lew’s announcement, the British government publicized a similar change to their currency: author Jane Austen is to feature on the next £10 note. The Pride and Prejudice author will replace Charles Darwin in 2017. Of course, there have been moments in American history where women were printed or coined on currency. Martha Washington is the only woman to appear paper money. 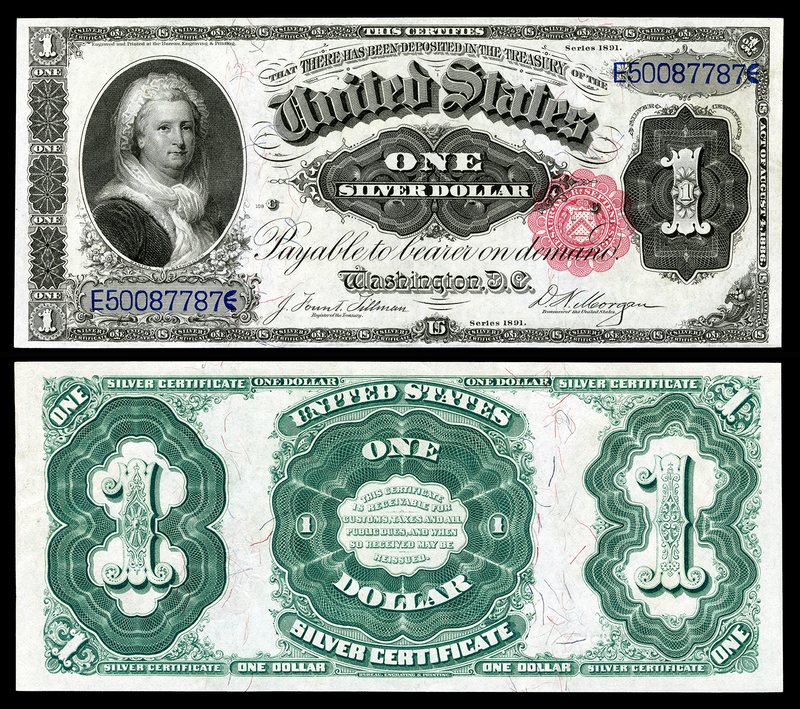 A one dollar silver certificate in 1886 depicted a copy of the famous Gilbert Stuart portrait of the First Lady; it was not officially discontinued until 1957. The history of women depicted on coined U.S. currency begins earlier. The Coinage Act of 1792 authorized the production of dollar coins from silver. Appearing in 1794, the “Flowing Hair” and “Draped Bust” images (below) depicted the allegorical image of Lady Liberty. The figure reappeared throughout nineteenth century designs as well in 1804, 1840 (the Seated Liberty dollar), 1849 (the gold dollar), 1873 (the trade dollar), 1878/1921 (the Morgan dollar), and 1921/1964 (the Peace dollar). In 1974 and 1975/6, the dollar coin changed designs again, respectively depicting President Eisenhower and (on the reverse side) the Apollo 11 moon landing and the Liberty Bell, commemorating the nation’s bicentennial. While “Didion on the Twenty” seems a bit too much, a bit too narrow and too contemporary to represent the American public–another meme in a series of memes–I think we’re on the right track. Why not celebrate the Arts or Sciences, American creativity and ingenuity? And something more relevant to the American people. What feelings does Andrew Jackson emit? What can the American people tell us about Alexander Hamilton? How do these men or at least their legacy–real or imagined–connect to our contemporary cultural milieu? This latest process of currency redesign is our opportunity to update and re-envision our nation’s narrative–our current values and our vision for the future. The debate on who is depicted on our currency is a debate on who we are as a people. Hopefully, it will also create a fissure in which we can re-examine some of the prejudice embedded in social norms and the inequality or ineffectiveness of current policies. This entry was posted on August 14, 2015 by k.a.wisniewski in New/Politics, Printing History, U. S. History and tagged U.S. Currency, Women on 20s.